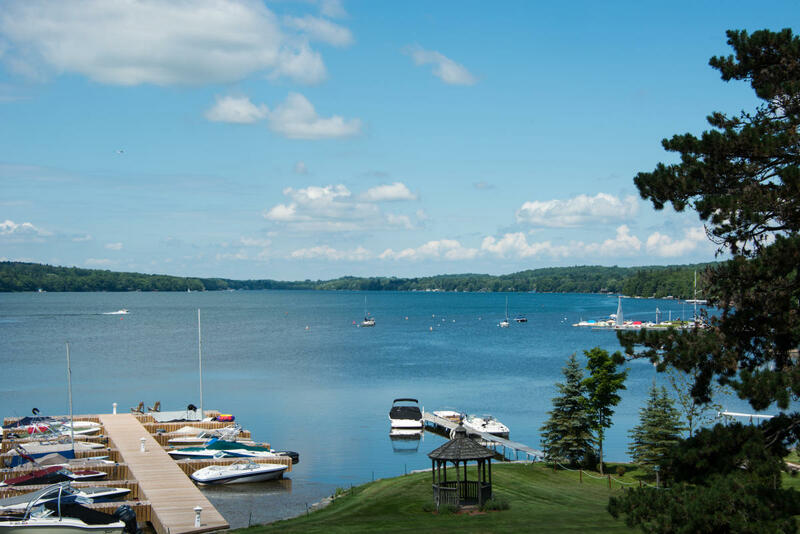 Cazenovia Lake is a medium sized heavily developed water body located in Madison County in the Village of Cazenovia. Physical Features: Elevation: 1200 feet Area: 1164 acres Shoreline Length: 9.5 miles Length: 3.9 miles Maximum Depth: 45 feet Mean Depth: 22.6 feet Town: Cazenovia Aquatic Plant Life: This lake traditionally has had significant rooted aquatic vegetation along the shoreline, out to about 15 feet of water, with extensive weed growth in the north and south ends of the lake. Most of this vegetation consisted of the exotic invasive Eurasian watermilfoil. The lake was chemically treated in 2009, 2010, 2012 and 2014 in an effort to reduce the amount of watermilfoil. With the milfoil reduction native vegetation should begin to increase in the lake. Access: McNitt State Park off East Lake Road. Hand launch and carry down. Approximately a 75 yard carry to water. Parking for 10 cars. Park hours are from 5:00 AM to 9:00 PM. Route 20 Department of Transportation Parking area. Hand launch. Lakeside Park. Fee launch with seasonal operation. Please call the Village of Cazenovia at 315-655-3041, or visit their web site for more information on the rules, hours and dates of operation for the launch. Fish Species: Largemouth bass, smallmouth bass, chain pickerel, walleye, black crappie, pumpkinseed sunfish, bluegill, rock bass, yellow perch, white sucker, and brown bullhead. Fishing: Largemouth bass and chain pickerel are the main gamefish in the lake. Largemouth bass in the 15-inch range are plentiful with some 20-inch fish caught each year. Legal length chain pickerel are also common. There is a sunken Island (or hump) about halfway up on the east side that's a good location for bass. The north end of Cazenovia Lake is a very popular ice fishing location for black crappie and bluegill. Bluegill and crappie can be caught during day, but anglers specifically targeting crappie often fish after dark. Just remember the McNitt State Park closes at 9:00 PM. Yellow perch are also found in the lake but are more elusive then the bluegills or crappies, but when found they are often nice sized and run in the 10 to 12-inch range. Rock bass are often overlooked by anglers but are plentiful and grow large in the lake.